← Happy Birthday Hike: Old Rag! As a horse-crazy kid, I was obsessed with the Black Stallion books. One of these, the spooky Black Stallion’s Ghost, takes place in a creepy, haunted version of the Florida Everglades and I’ve been a little uneasy about the place ever since. Last time I drove to south Florida, on a Christmas break road trip my junior year of college, we planned to camp, but totally chickened out on account of the alligators and ended up spending a very uncomfortable night in my little VW. Last summer, I tackled my alligator fears by taking gator wrestling lessons and on this trip, we had great fun sizing up the beasts, secretly hoping for some kind of small to mid-sized alligator emergency that might require our badass wrangling skills. But my general unease about the Everglades still haunted me; I am not comfortable in this place. I blame the early influence of the Black Stallion’s Ghost. We spent our first night in south Florida camping in Picayune Strand State Forest, a curious place across Alligator Alley from the Florida Panther Wildlife Refuge. In the 1960’s a developer called the Gulf American Land Corporation purchased nearly 60,000 acres of densely forested swampland here in hopes of turning it into “Golden Gate Estates” the largest subdivision in the U.S., with a projected population of 400,000 people. In a few years, more than 880 miles of gravel roads and 180 miles of canals were laid out in a vast grid of 1.5 and 2.5 acre lots. But the place proved uninhabitable. What looked like a jungle in the winter turned into swampland in the summer, overrun with mosquitoes. Golden Gate Estates went bankrupt, but not before it sold 30,000 lots to unsuspecting buyers. One of the many abandoned roads through the Picayune Strand. Would you want to build a house here? In the 1970’s Golden Gate Estates’ abandoned roads, particularly Everglades Boulevard, were used as clandestine landing strips for small planes loaded with drugs from Mexico and South America and the place developed a reputation for swallowing bullet-riddled bodies. 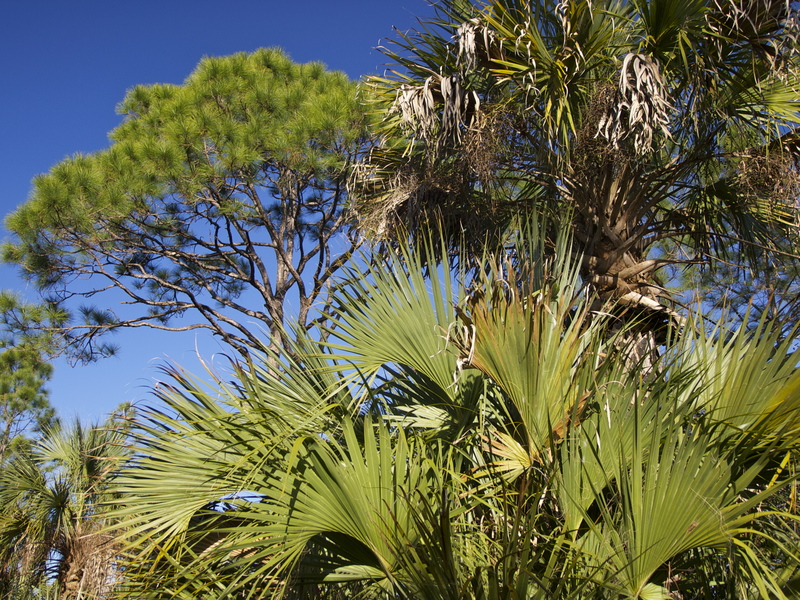 In 1985, the “Save Our Everglades” conservation program hatched an ambitious, $25 million dollar plan to purchase vacant lots from 17,000 landowners to create a wildlife sanctuary. 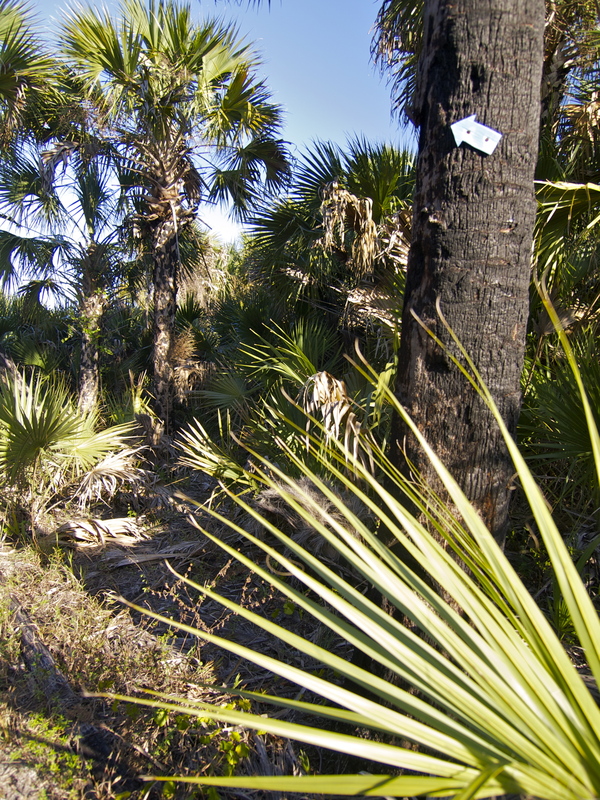 By 2006, the mission was completed and Picayune Strand State Forest was born. We spent a chilly night at the trailhead for the Belle Mead Horse Trail and set out in the morning for a hike. The sandy path took us through the incredibly dense jungle. No wonder wildlife biologists spent months trying to track Florida panthers here and found only ghostly footprints and no actual cats. 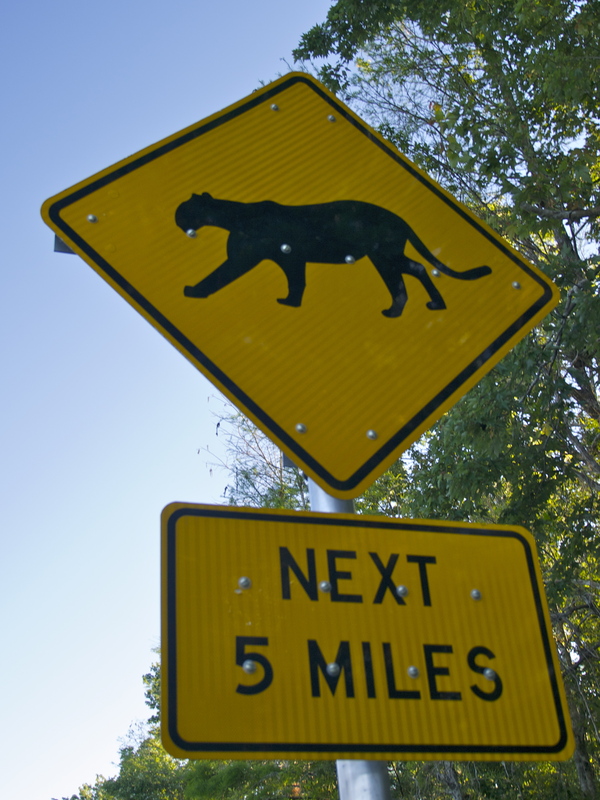 About 100 panthers still live in south Florida, but they’re rarely seen. You could pass within a few feet of an elephant here and never know. At one point on our hike, I reached into my pocket and realized I had dropped the marginally useful map I had picked up at the trailhead. We turned around, retraced our steps and found it lying on the trail, but those moments felt a bit like treading water in the open sea. If you got lost here, you’d have a hell of a time getting found. Trail marker in Picayune Strand. If you lost the path, you would have a snowball’s chance in hell of finding it again. Back in the car, the adventure continued. According to the map, we didn’t have to leave the park the same way we had come in. We could follow the main gravel road west, towards highway 951 and come out near Naples. Soon we found ourself in a maze of unmarked roads, most of which were dead ends. Every now and then we’d pass full garbage cans at the end of a driveway. Incredibly, a few of the lots are inhabited! Eventually we crossed the infamous Everglades Boulevard, the name faintly spray painted on the ground and turned west, towards Naples. But the road quickly went from bad to worse, rough and rutted, with a tangle of unmarked intersections, each route less promising than the last. Clutching the all but useless black and white map we had picked up at a kiosk at the entrance to the park the night before, I guessed at each intersection, steering us vaguely west. My sense of dread sloshed in the bottom our nearly empty water jugs: the campground didn’t have water and we were low. If we got stranded, we’d have a thirsty hike to help. And then, all of a sudden, we were out, emerging into the bright white light of Naples, one of the ritziest cities in South Florida. That’s Florida for you: land of contrast! Stay tuned for tons of pix from Everglades National Park! 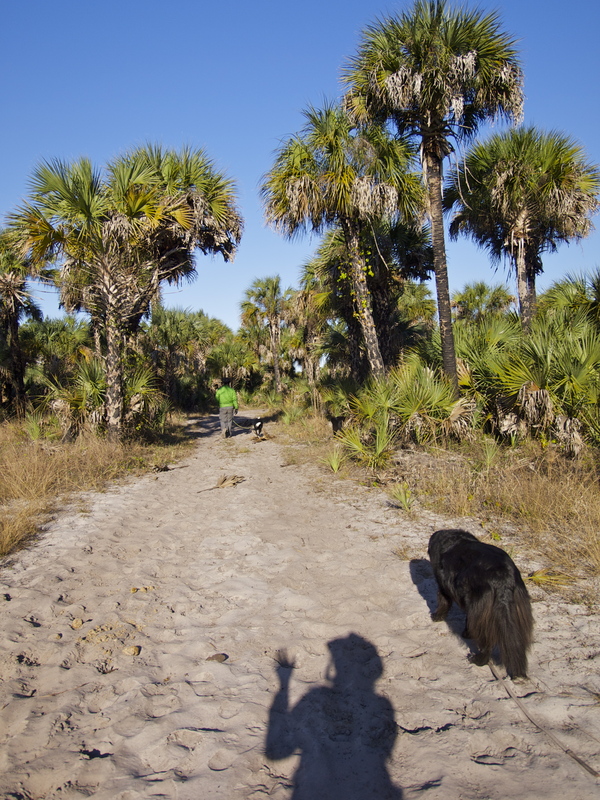 This entry was posted in Bowie & D.O.G., Hiking!, Photography, Road tripping!, Sustainable Living, Uncategorized, Vagabonding 101 and tagged Florida Everglades, Florida Panther, Golden Gate Estates, Picayune Strand. Bookmark the permalink. What fun. The first time I visited Picayune, I actually came to it from the south, accidentally. 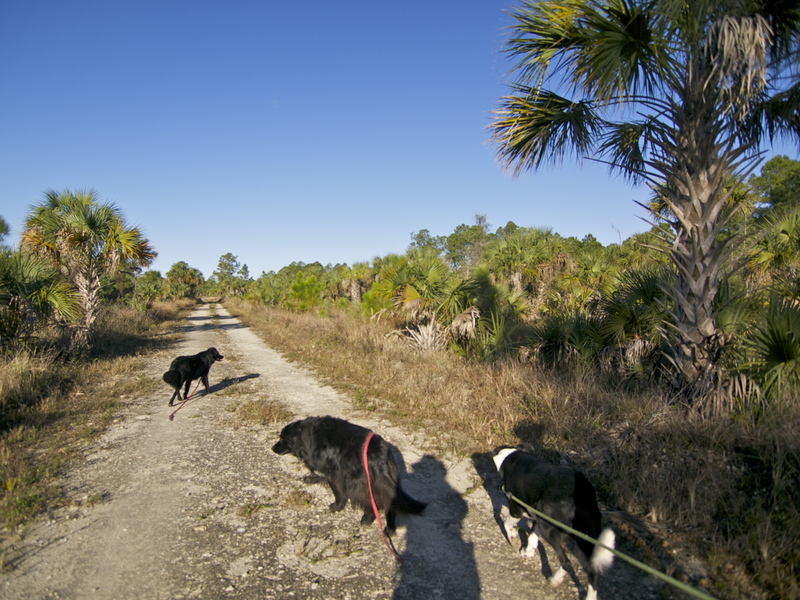 I’d trekked through Fakahatchee Strand Preserve, making my way north. Then, rather abruptly, the thick wetlands of Fakahatchee gave way to the dryer but still lush expanse of Picayune. I didn’t have a map, but had a good sense of direction, so I kept a north-or-west direction. After hitting a number of dead ends, I finally made my way out. Heh. A cool area and not one that’s on everybody’s radar. You make me want to return! I was driving, heading north from a day in Fakahatchee. Now *that’s* some wet, mosquito-ridden adventure playtime!!! If you want orbweavers in your hair and mosquitos in your shirt, Fakahatchee’s just the place! Heh. I was grateful for the relative dryness of Picayune. I really enjoyed this post. I have had a similar experience exploring a development project gone sour. Rio Rancho, New Mexico, has many dirt roads and plots of land on the west side, constructed many decades ago, initially meant for housing. Of course, it never came to fruition, although many plots were sold. One was to my grandparents, which I inherited. I visited it a few years ago, and while the scenery is vastly different from what you saw in Florida, it is no more inhabitable. The high desert in its natural state is a very intimidating thing. I wonder how the owners of the Earthship felt when they first purchased their land in NM…Enjoy the rest of your travels in FL! Interresting place indeed. So , they do allow dogs on the trail?? I would almost be afraid they might get eaten by something . Yes, dogs were allowed on the trail. It’s possible they could have been eaten by something, but they stay right with me and I’m willing to take more than a few risks in my crazy life. I grew up in South Florida and will always be haunted by the Everglades (but not the Black Stallion books; Swamplandia, yes.). It wasn’t so much the alligators or water moccasins or coral snakes or fire ants, but the sawgrass and the mucky muck water and the bugs. Bugs everywhere. And now, the errant python. I think you should find someone to go python hunting and write about that. You might even win some cash prizes! Yeah the mosquitoes weren’t nearly as bad as I thought they might be, but two got into our tent and left Drew with more than 50 bites on his feet! He was suffered for a few days! Thankfully salt water is the best cure and there was plenty of that in the Keys! I looked into the python hunting contest, out of curiosity, but I love snakes too much to kill them, even if they are invasive. Sounds like it’s time for a handheld gps ! We can’t have you getting lost in the everglades and becoming gator bait. Last week an elderly gentleman left his home in Punta Gorda for walmart and never returned, a silver was issued. My wife + I found him in Picayune Strand that evening, he was confused, lost and out of gas. I don’t think he would have made it through the night.